This map from carto.metro.free.fr shows the route of the Barking Riverside Extension of the Gospel Oak to Barking Line and how it connects to the c2c lines between Barking and Tilbury. One big advantage is that the two c2c lines between Barking and Tilbury, go either side of the Barking Freightliner Terminal. 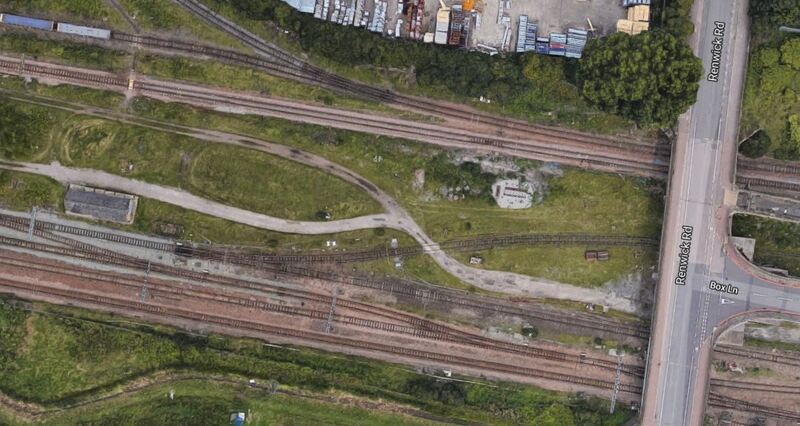 The Down Tilbury Line between Platform 7 at Barking station and Dagenham Dock station goes around the Northern side. The Up Tilbury Line to Platform 8 at Barking station goes around the Southern side. This is extremely convenient, as there is plenty of space between c2c’s busy tracks to build the flyover. If you want to get a better look, click on the map and this will give you a larger image on which you can follow the two tracks from Dagenham Dock station. This second map from carto.metro.free.fr, shows the complicated tracks to the West of the Freightliner Terminal. The Renwick Road bridge goes North-South over the tracks. I appears to cross, at the point, where the Stora sidings join the East-West track. Note how the two new tracks connect the flyover to tracks that connect to Platforms 7 and 8 at Barking station. 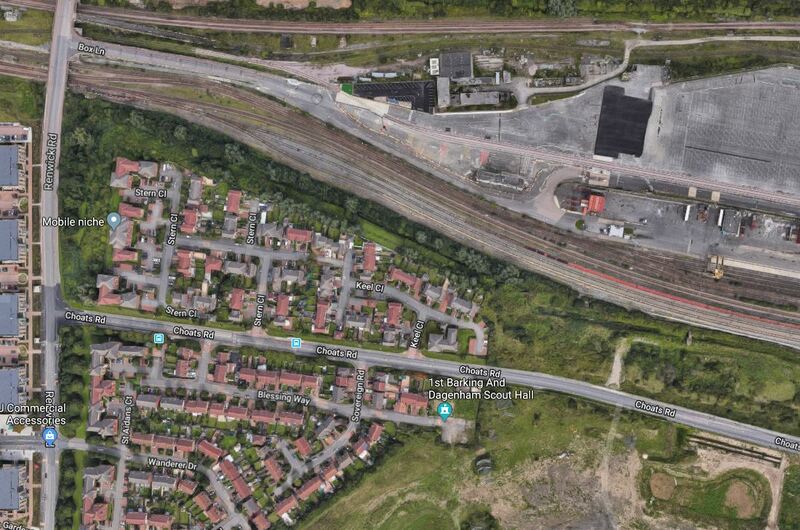 This is a Google Map which shows where the Renwick Road bridge crosses the tracks. The two new tracks will need to be squeezed under Renwick Road. I took these pictures on a walk down Renwick Road, just to the South of the bridge, that takes the road over the railway lines. Unfortunately, most of Renwick Road is surrounded by high concrete walls. But as these pictures show, there is quite a large amount of land crossed by a few sparse railway lines. I then took a train between Barking and Rainham stations and was able to take a few pictures of work in the area of the proposed viaduct, which will go over the freight terminal. The red train was parked on theStora sidings at the top of the second map. The top four pictures were taken going to Rainham station and the bottom four were taken coming back. These pictures were taken from a train going to Grays station on the Tilbury Down Line. The last two picture show the Renwick Road bridge and the vehicle ramp leading to the freight terminal. It looks to me, that two new tracks will do the following. Start to the West of Renwick Road bridge, with connections that take them to Platforms 7 (Down) and 8 (Up) at Barking station..
Go through the safeguarded site of the future Renwick Road station and under Renwick Road. Climb on a viaduct, that will lift them over the freight terminal and the lines to Tilbury and continue to Barking Riverside. It could be a spectacular ride. I walked to the Renwick Road bridge from the Renwick Road bus stop on the 173 bus from Dagenham Heathway station. It was about four hundred metres along broken pavements and in freezing cold, but dry weather. So a Renwick Road station will be appreciated by those, who live and/or work in the area. Wikipedia says this about Renwick Road station. The station would lie east of the proposed merge / diverge points with the Essex Thameside (Tilbury Loop Line) line along which c2c services operate, so whilst the station would not provide an interchange with the aforementioned c2c services, nor would the station’s construction disrupt those services. The new station could generate 5,000 homes. This Google Map shows the land to the West of Renwick Road bridge. The Stora siding at the top, where the red train was parked. The Down Tilbury Line going West-East towards the top of the map and connected to the sidings. It could be that Network Rail could have decided to put the new Renwick Road station in the ample space between the lines. The station could be very simple. A single island platform between the two tracks. The tracks could be generously spaced to allow a wide platform. The platform would have shelters and perhaps a coffee stall. The platform would be linked by stairs and a lift to Renwick Road. It could certainly be built without disrupting c2c services. According to the Wikipedia extract, I included earlier, Renwick Road station, will not have a direct service to Fenchurch Street station. Renwick Road station will be served by at least four London Overground trains per hour (tph) all day between Gospel Oak and Barking Riverside stations. Currently, c2c provide the following services between Fenchurch Street and Grays station. It is also planned that both services will share Platforms 7 and 8 at Barking station. So passengers from Renwick Road and Barking Riverside stations wanting to go to London will get off a train on Platform 8 at Barking station and wait for the first c2c service to Fenchurch Street station. I would also suspect that c2c will increase the Off Peak service to match the frequency of the Gospel Oak to Barking Riverside service. Beam Park station is another new station planned for the area. It will be between Dagenham Dock and Rainham stations. It will be built to serve three thousand new houses. This station will make it more likely that c2c will run four tph between Fenchurch Street and Grays stations. This will require a change at Barking station. This change would be a walk across the island platform 7/8, which would be step-free. Train services along the Thames from Barking to Grays are going to get a lot better.